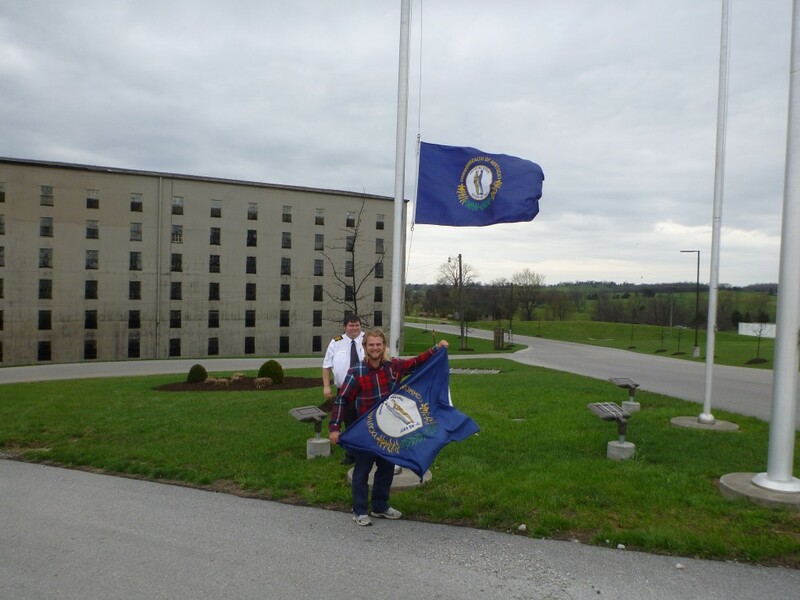 On Monday (4/6/15) I left early so I could arrive at Makers Mark Distillery before the first tour started. I’ll be the first to confess that I don’t have any super strict preferences when it comes to alcohol, but ever since my cousin, Wally, turned me on to Makers Mark it’s been my liquor of choice. 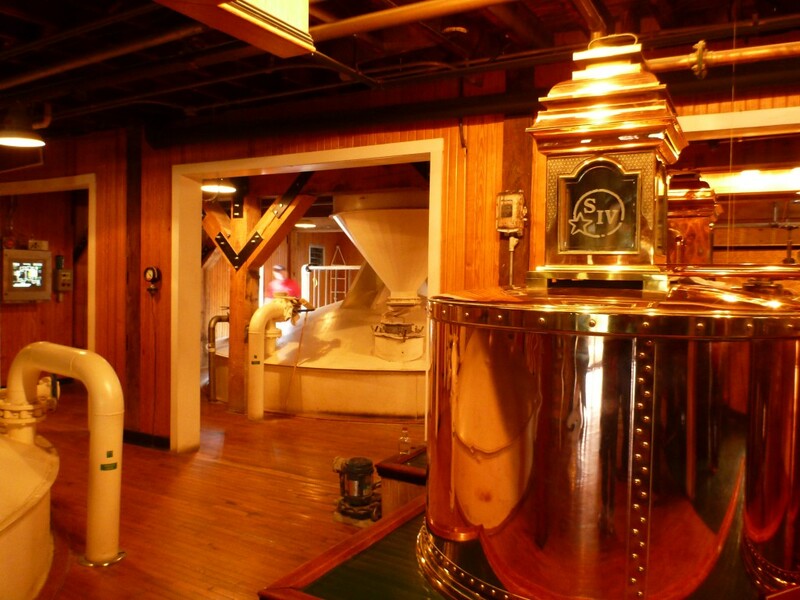 Maker’s Mark Distillery – “White Dog” (un-aged whisky) straight from the still flows into the “S IV” box and down into the vessel below. 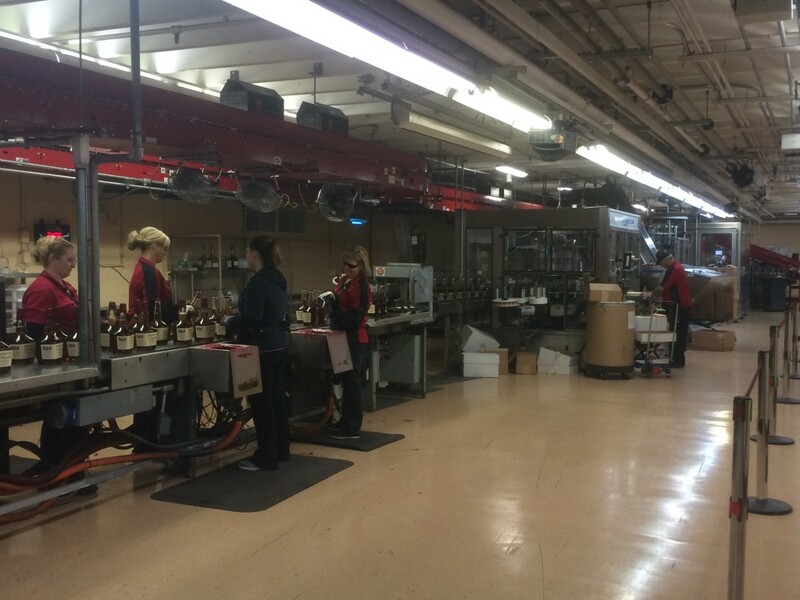 Maker’s Mark bottling facility. Wax dipping happens last. 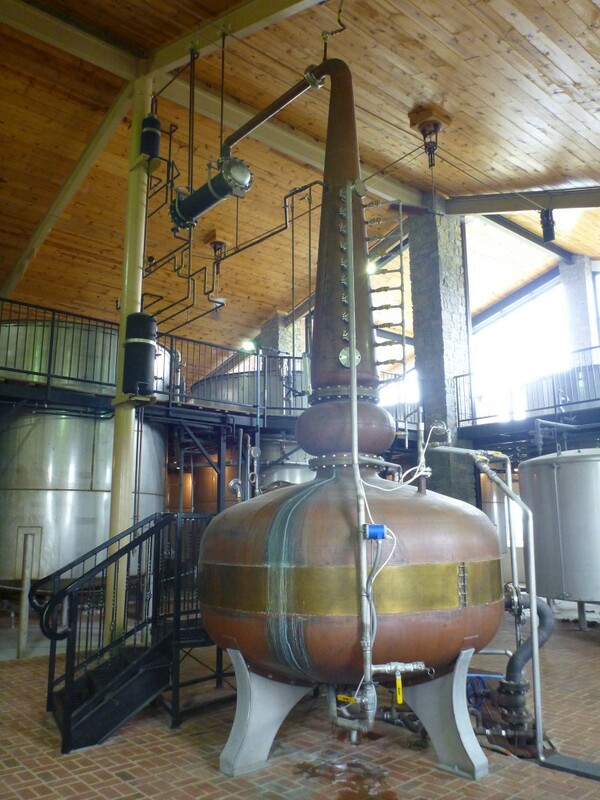 Each of the three distillery tours I went on stressed the level of craftsmanship that goes into creating their bourbon. And it’s true. The diligence they put into perfecting their process is impressive. I’ll just say that the actual affect all that tinkering has on my personal enjoyment of their whiskey is still up for debate. Willette employee, pest control dept. Willett still. Eat your heart out, process engineers. What really draws me into distilling is the science behind the process. Corn (~70%), rye (~15%), and barley (~15%) are ground up and soaked to draw the starches out. Hot water is used to break those starches down into simpler sugar compounds. After cooling, yeast is added, and over ~3 days the yeast “eats” some of the sugar and yields a solution of ~10% alcohol. At this point it’s practically beer. Then its stored for ~6 years or longer in freshly charred 50 gallon wooden barrels, during which time the flavor character and color are developed. Before being aged the whisky is called “White Dog” and it is colorless and smells a little like vodka or gin. Pretty simple – but the devil is in the details. Wild Turkey uses a #4 char, Makers Mark uses a #3 (less burned). 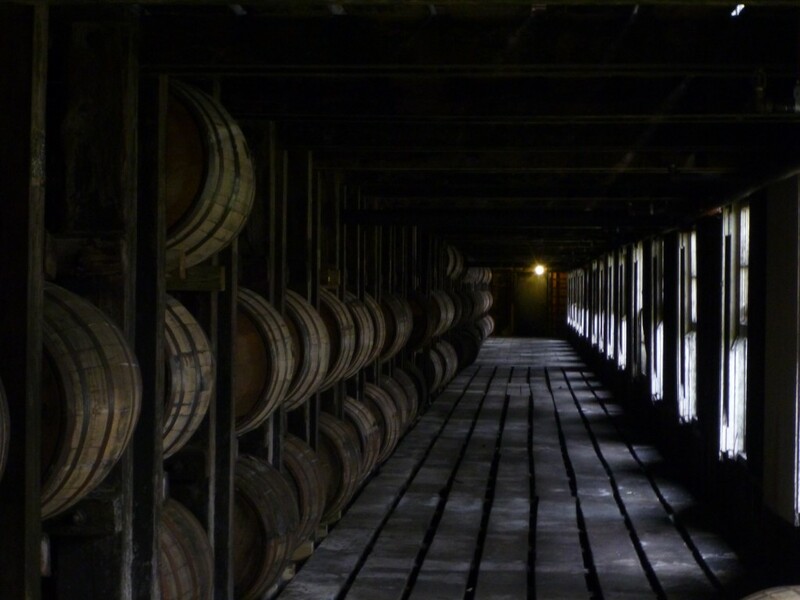 Makers Mark turns their barrels at some point during the aging process, Wild Turkey does not. Wild Turkey has been using the same sacred yeast strain since the 60’s and they keep a cryogenically frozen emergency culture of it somewhere remote like Kansas just in case something happened to their stock in Kentucky. 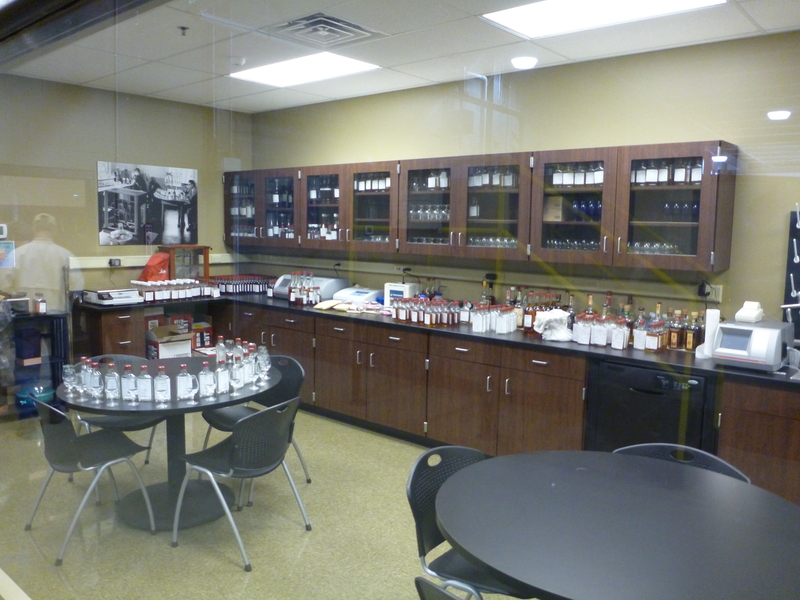 Wild Turkey quality control lab. Wild Turkey aging barn, drenched in sweet sweet bourbon vapors. A fraction (about 2%) of the total volume is lost to evaporation through the barrel wall. It’s known as “The Angels’ Share”. 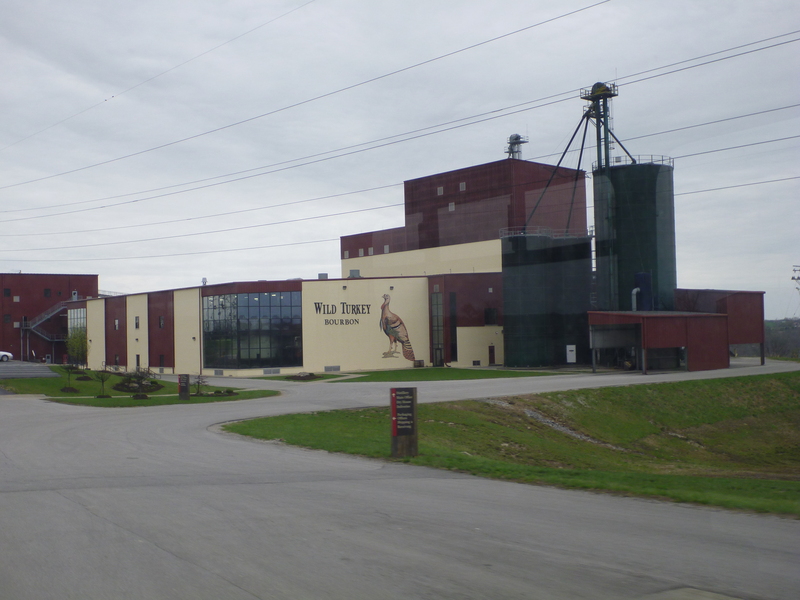 Wild Turkey’s brand new distillery. I’m happy with the way things worked out with my improvised Bourbon Trail tour. Between the three distilleries I saw a wide range in techniques and overall production capacity. 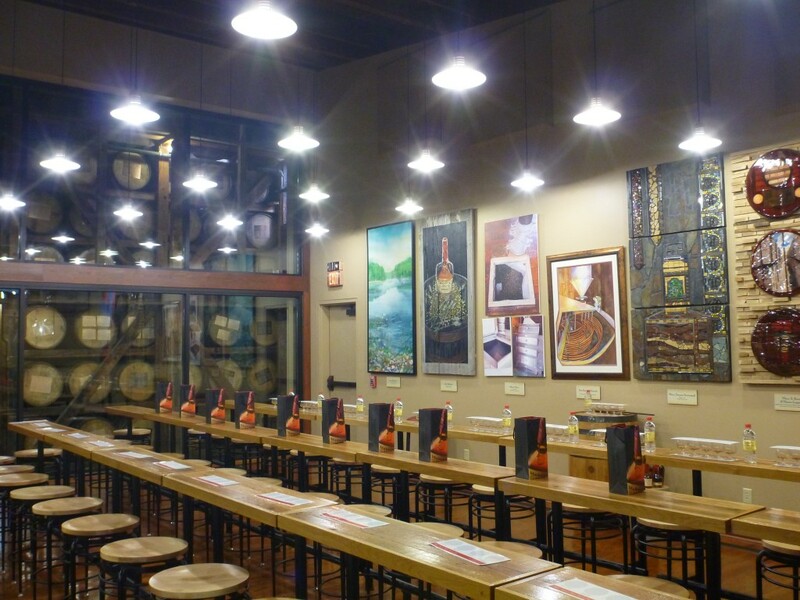 Makers Mark had the most thorough tour, showing every single step of the process from crushing grains to bottling. 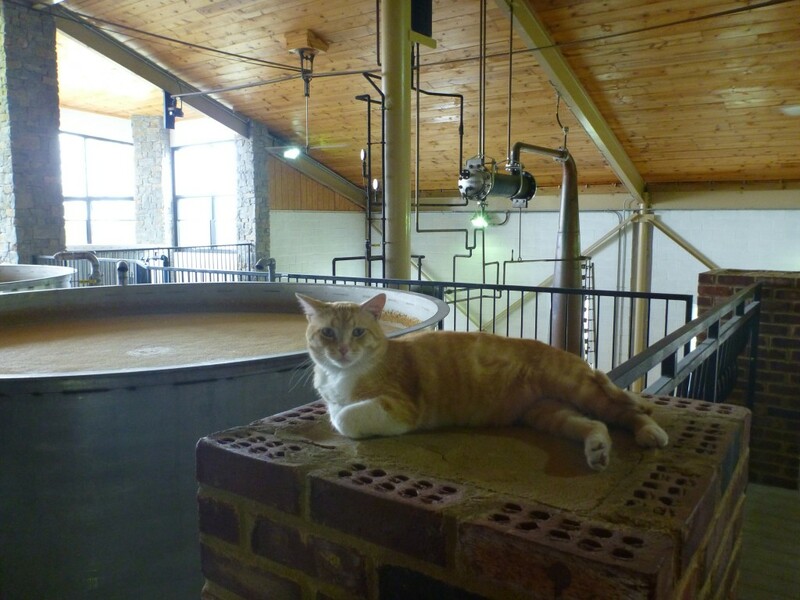 Wild Turkey had the most knowledgable tour guide. 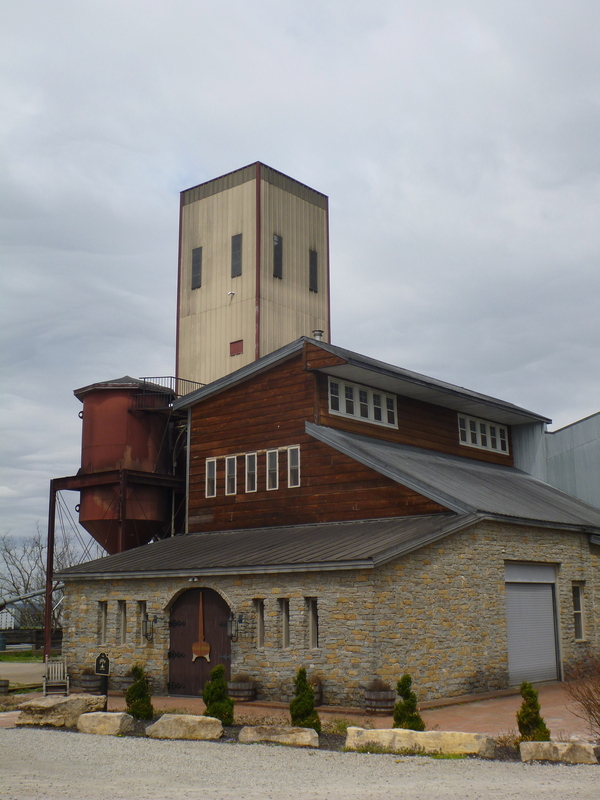 Willett had a friendly bourbon tasting environment, and it was fun to see what a “mom and pop” distillery was like. Thanks to Stuart over at Wild Turkey, I got my Kentucky flag swap taken care of too! 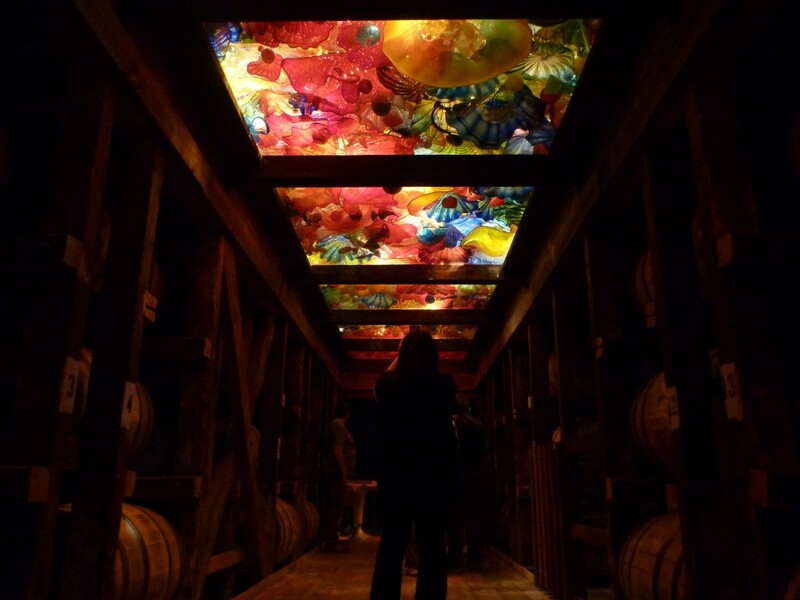 “The Spirit of the Maker” Chihuly installation at Maker’s Mark. West Virginia is on deck. I too am a Scotch man, primarily because you don’t get that awful next day head ache. Scotch and a tab of water is hard to beat. Its been about 7 yrs since II imbibed. ps Phyl’s Birthday is May 5, a big 90. It’s true, bourbon does have the sugar that makes the headache a little worse, but I’ll concede a worse tomorrow for a better today in this instance. hah! I heard about Phillis’ birthday! So impressive. Tell her to keep an eye on the mailbox! Yayyy! Flag swap from a distillery!!! I know! It just doesn’t stop!